LOCATION: Blackbird Lane, Pomona, CA. SUSPECT: Sergio Valdes, 43-year old, Pomona Resident. On 10/02/18 at approximately 9:30AM Sergio Valdes assaulted his father in a unprovoked attack. During the attack Sergio armed himself with a kitchen knife and stabbed his father multiple times. 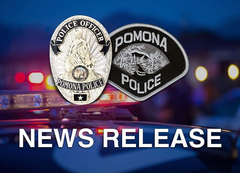 The victim was rushed to Pomona Valley Hospital Medical Center where he unfortunately succumbed to his injuries. As officers were searching the area they located, and arrested, Sergio a short distance away from the crime scene. Detectives are currently conducting their investigation in an effort to identify a motive for the stabbing. Charges are pending while the case is reviewed by the Los Angeles County District Attorney’s Office. Anyone with information regarding this incident is encouraged to contact the Pomona Police Department at 909-620-2085. If you prefer to provide information anonymously, you may call "Crime Stoppers" at 1-800-222-TIPS(8477).